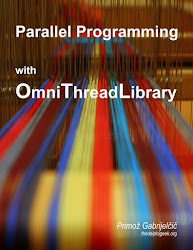 OmniThreadLibrary 3.02 was released today. This is mostly a bugfix release with few new parts (XE3 support, Async/Await). Update is strongly recommended for everybody. Get it as a zip or from the svn. Added XE3 packages and test projects. Added OnStop overload to Parallel.ForEach that accepts 'reference to procedure (const task: IOmniTask)'. Added OnStop overload to Parallel.Pipeline that accepts 'reference to procedure (const task: IOmniTask)'. IOmniBackgroundWorker extended with task initializer (Initialize) and task finalizer (Finalize). IOmniWorkItem extended with property TaskState. Inlined bunch of TOmniWorkItem methods. Parallel.Join was broken if number of task to be executed was larger than number of threads. Thanks to [Passella] for reporting the problem. Invalid 'joinState' was passed to the worker task in Parallel.Join if number of tasks to be executed was larger than the number of worker threads. Thanks to [meishier] for reporting the problem. Fixed race condition in task teardown. Big thanks to [meishier] for putting together a reproducible test case. ForEach finalizer is called if an exception occurs inside the ForEach task. OtlParallel added to packages. Thanks to [Mason Wheeler] for reporting the problem. Fixed bug in TOmniTaskGroup.TerminateAll - maxWait_ms parameter was ignored. Thanks to [morlic] for reporting the problem. Workaround for an internal error in D2009. Thanks to [ToHugie] for reporting the problem and to [Hallvard Vassbotn] for providing a fix. Fixed various scenarios where Invoke was not working. Thanks to [geskill] for providing report, test case and incremental testing on my partial solutions. XE2 and XE3 design packages were referring to wrong runtime package (XE). TOmniEventMonitor is marked as 64-bit compliant in XE2+. Thanks to [M.J. Brandt] for reporting a problem. Marked IOmniParallelLoop.OnMessage as deprecated (use TaskConfig.OnMessage). 53_AsyncAwait: Demonstration of the new Async/Await abstraction. ForEach output: Demonstrates how to 'flow' ForEach output directly into the main thread which immediately processes the data. Twofish: Parallel implementation of the FishFacts demo. Any chance of adding an example of exception catching in the Async/Await example. Its absolutely awesome, as a C#/Delphi coder, having this sugar make my life so much easier. Thanks for an amazing library. I can't think of a good syntax for exception catching. Amazing. "Must have" components for serious multithreading development.